Anderson came close to extend the match after holding five set points to force a fourth set. 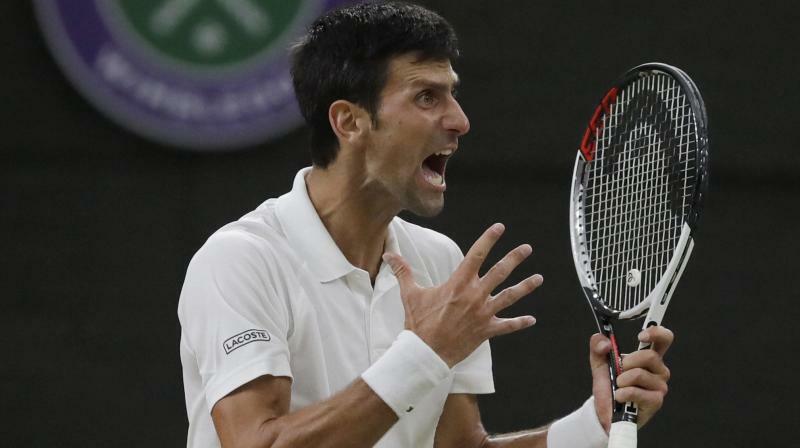 London: Novak Djokovic won his 4th Wimbledon title on Sunday after dispatching Kevin Anderson in straight sets by 6-2, 6-2, 7-6(3). The Serbian now stands fourth in the all-time Grand Slam singles final list, behind the likes of Roger Federer (20), Rafael Nadal (17) and Pete Sampras (14). Anderson came close to extend the match after holding five set points to force a fourth set. However, Djokovic kept his nerve and saved all five to take it into a tie-breaker, which he managed with ease. IT'S ALL OVER! Anderson's forehand return finds the net and Djokovic wins the tie-breaker 7-3. Anderson saves the championship point with a fine smash. Anderson pulls one back to keep things alive. Djokovic races to a three point lead as Anderson volleys long after a low backhand pass from the Serb. Anderson picks up the first point before Djokovic draws level through a backhand down the line. The duo play a long rally before Djokovic seals the winner with an ace. Gear up for the tie-breaker. Anderson's defensive approach has worked wonders and he has been making life difficult for his opponent. Game on. A string of unforced errors by Djokovic hands Anderson the advantage for a set point twice but the Serb holds his nerves to peg back. Anderson unleashes a couple of aces and regains the lead. OH DEAR! Anderson races to 40-30 but then Djokovic seals the next two points to make it level again. WHAT A FIGHTBACK! Anderson speeds to 40-0 in no time but an uncontrolled forehand then lands wide. He makes no mistake to gather the lead again and it's game on. THREE ALL! Djokovic races to another game like a thunderbolt without dropping a point. The big man finds his groove and races to 40-15 but an excellent forehand from Djokovic makes it 40-30. But Anderson holds his shape and wins three games for the first time in a set this evening. GAME, DJOKOVIC! Ruthless reply from the Serb who draws level without losing a point. Anderson gives one back as he picks up a slender 2-1 lead. The big man holds his serve comfortably to edge Djokovic. WHAT A RESPONSE! Djokovic recovers well and bags his first game of the set without losing a point. Anderson forces Djokovic into a string of errors to race to 30-15. Nets a forehand to seal the game and he's charged! The Serbian is edging closer to his 13th Grand Slam as he seals another set with ease. Djokovic picks up the advantage with a double-handed back hand and then seals the set with a bombarding serve which proves too good for Anderson. The long rallies keep the big South African going but he has no answer to some of the fine returns Djokovic is producing. The Serb seals the game by baffling his opponent with a forehand in the direction he was running against. The Serbian is hardly breaking a sweat here as he races away with another game comfortably. Anderson leashes another forehand wide to give his opponent a three-game lead. Anderson plays a long rally to pick up a 15-0 lead but Djokovic proves to good again and comes out all guns blazing. Anderson has an advantage but regains it after Djokovic's backhand finds the net in the longest rally of the match. Anderson finally wins his first game of the second set after his cheeky drop shot forces Djokovic to strike the net again. Djokovic once again continues his fine rhythm. He is wasting no time whatsoever. The Serbian is proving to be too good for his opponent here. Anderson goes down 15-40 before Djokovic sends a backhand towards the baseline. Anderson appeals but Hawk eye shows it's in. One-way traffic as Novak Djokovic bags the first set in just 29 minutes. Forces Anderson into a string of errors (forced and unforced both). Anderson revives himself after losing three straight games. But is it a little to late? Djokovic grows stronger and stronger. The early nerves are taking a toll on his opponent who looks lost. The Serbian strengthens his leads, once again. Anderson forehands are mistimed and he goes down 15-40 before Djokovic wins the game with a classic drop shot. Anderson revives himself after going down to 40-0 but then his opponent seals the game with a fierce cross-court forehand. First game in the bag for the South African, who seals it without dropping a point. Anderson serves first and takes it to 30-15. But two unforced errors by him and a double fault hands Djokovic the start. Early nerves. Novak Djokovic will be gunning for his 4th Wimbledon title when he takes on Kevin Anderson in the men's singles final on Sunday. The Serbian star sets sights on his 13th Grand Slam trophy, his first in two years after enduring a horrific surgery on his right elbow that caused a dip in form. Meanwhile, South Africa’s Kevin Anderson gears up for his second major final. The 32-year-old finished runner-up to Rafael Nadal during US Open 2016. Both players are heading into the match after a marathon semi-final, two of the longest in Wimbledon history. Anderson was locked in a battle for more than 6 hours before edging John Isner 26-24 in the fifth set on Friday. Djokovic, on the other hand, needed 5 hours and 15 minutes to overcome Nadal in another epic clash on Saturday. The duo has faced each other five times previously, with Djokovic coming out on top in five occasions. Where is the final being held? The Wimbledon 2018 men’s singles final will be played at the All England Club, Centre Court. The match is expected to start around 06:30 PM (IST). The match will be broadcasted on Star Sports Select 1 and Star Sports Select 1 HD. Live action will be available on Hotstar.com and can also be streamed on the Hotstar app.